Jellyfish will screen at the 10th edition of Les Arcs film festival in France this December. For more information on tickets and the festival click here. Jellyfish will have its Irish premiere at the 63rd edition of Cork Film Festival, Ireland’s largest and first film festival. For info on screening times and tickets, click here. 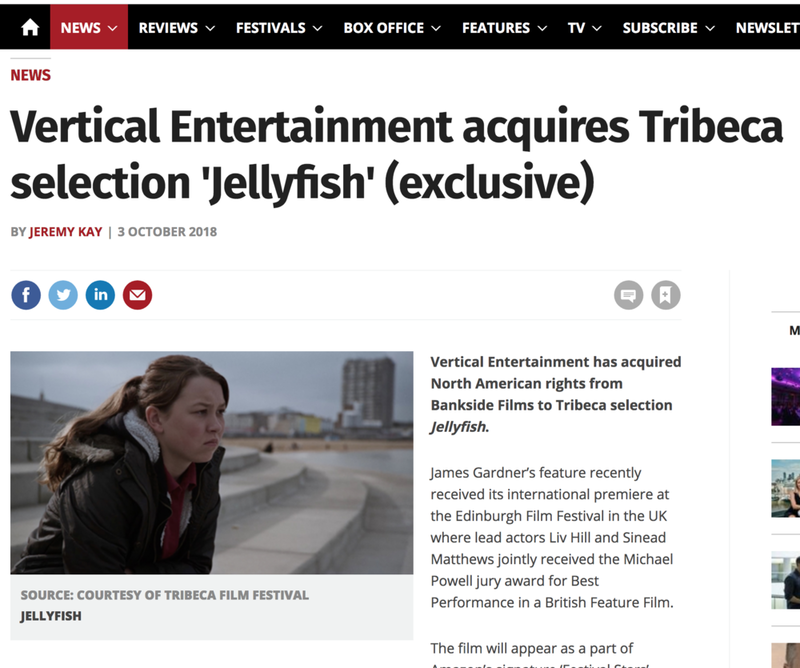 We’re very excited to announce that Vertical Entertainment have acquired Jellyfish for distribution in North America, which means that audiences in North America will be able to see Jellyfish on Amazon Prime later this year. Read more here. Liv has been unveiled as a Screen International ‘Star of Tomorrow’. Read what Liv had to say about the list on the Screen website by clicking here. Watch highlights of the Jellyfish team at the Dinard awards ceremony. Screen Daily have a published an article on Jellyfish’s success at Dinard Film Festival. Read more by clicking here. Shocked… Humbled… Gobsmacked. Jellyfish has won FOUR awards at Dinard Film Festival! The film was awarded the Screenplay, Critic and Grand Jury Hitchcock awards, as well as a fourth for Liv who was awarded an honorary new Hitchcock for best performance, a first in the festival’s 29 year history. We would like to thank the festival staff, audiences, critics and the jury for honouring our film. We are truly, truly humbled. Dinard, you are magic.